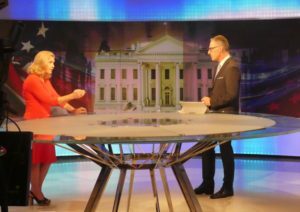 News media coverage of Donald Trump is a hot topic in Slovenia, the native country of First Lady Melania Trump. Like many Americans, TV viewers and social media consumers suspect they’re not getting the whole story from the mainstream media. They are also eager to have a conversation about free speech and the role of the journalism in a democracy. Making a point about media coverage of POTUS and FLOTUS. 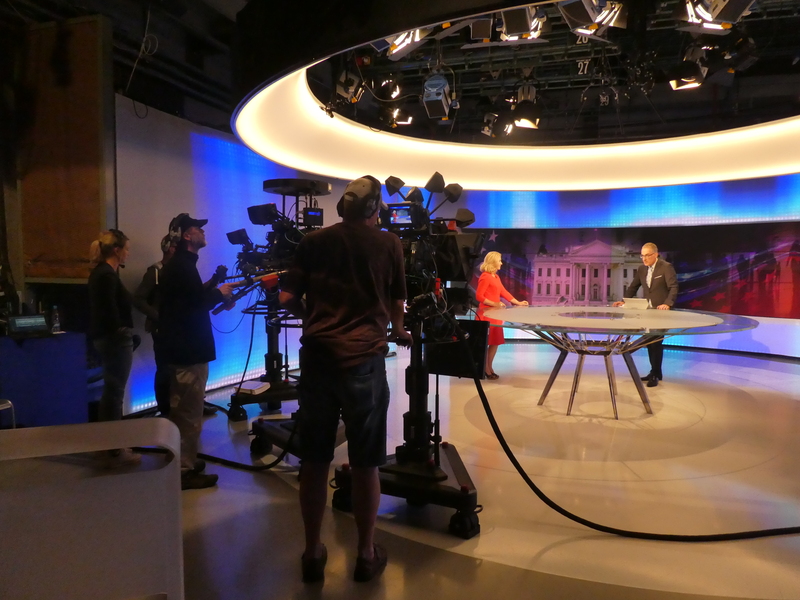 I found myself in the middle of that conversation when I appeared as a guest on Odmevi, the nightly in-depth news analysis show on Slovenia’s public broadcasting network. The interview followed a report from a New York-based correspondent on the first six months of the Trump Administration. The interview was recorded in English prior to the live broadcast so that it could be subtitled in Slovenian. 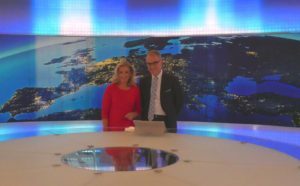 When it aired, my Twitter and Facebook feeds immediately lit up with comments, leading to a followup interview on a leading Slovenian news website. I recently became a dual citizen of the USA and Slovenia through my ancestry in the land my paternal grandparents left more than 100 years ago. I was in Ljubljana for a two-week intensive summer course in the Slovenian language. I also write a travel blog, which started out 10 years ago as an outlet for reporting on the fascinating places I get to visit as a TV news talent coach and international media trainer. And frankly, I’ve embraced travel writing as a way to bring people together in a world that is presently divided by politics — the beat I covered for a couple of decades as a news anchor and reporter for CBS and NBC stations, as well as a national program on the startup network that spawned both Fox and MSNBC. 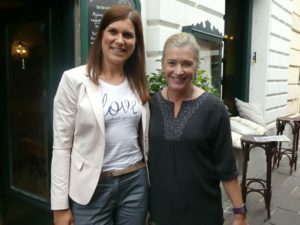 I wasn’t looking to talk politics on my trip to Slovenia; I just wanted to connect with a local travel blogger whose work I admired on her site, Let’s Go Slovenia. Meeting with a fellow travel blogger led to my 15 minutes of national TV fame. Thanks Marijana! 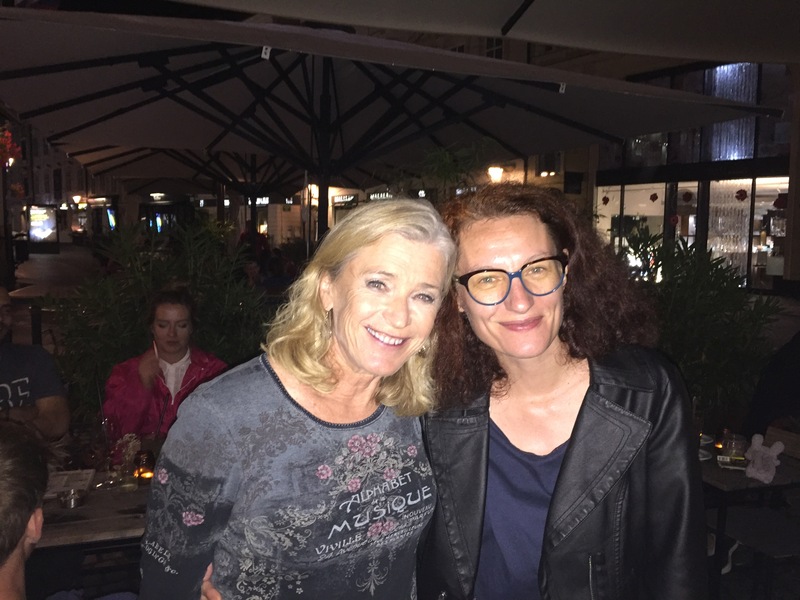 When I met Marijana Podhraski at the historic Nabotičnik skyscraper on a Sunday afternoon, we clicked immediately. 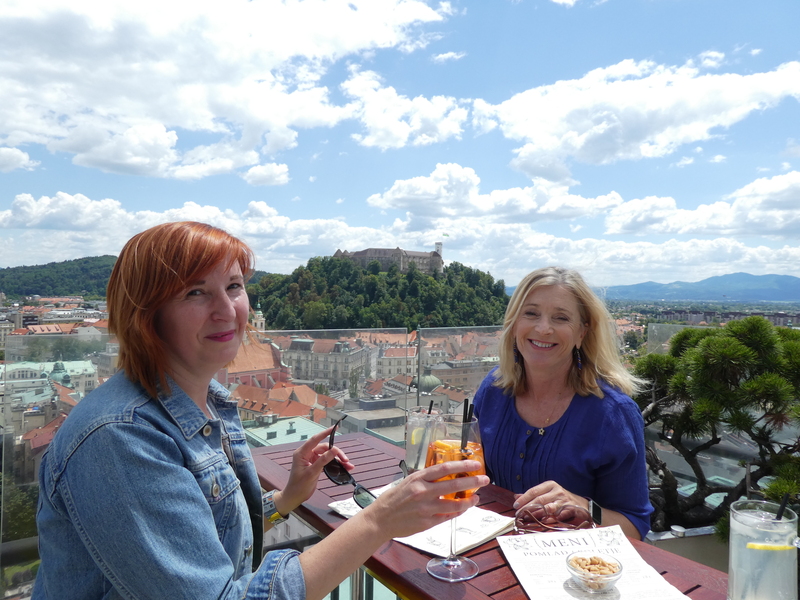 It wasn’t just travel blogging we had in common: we had both worked in TV news. From a producer background, she had moved into online journalism and also had worked with refugees from the Balkan conflicts of the 1990s. She still had contacts in broadcast journalism and asked me if it was OK to let people know I was in town. Little did I know how quickly it would lead to my 15 minutes of fame on national television! The next day, I was contacted by TV Slovenia journalist Helena Milinkovic, who agreed to meet me during my lunch break from language school. 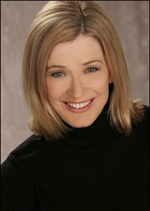 She quickly impressed me as someone with a passion for on-scene news reporting and getting to the heart of the story. I smiled as we compared notes and discussed the logistics for my interview. But inside, I was in full panic mode. What would I wear? I was on holiday with no “solid bold color” TV-friendly outfits in my suitcase. I didn’t have any TV makeup with me, either. I hadn’t even bothered to visit a hairdresser before leaving on the trip. And most important, what would I say to convey the complex relationship between Trump and the media? A quick after-school shopping trip took care of the wardrobe issues. Everything goes on sale in Ljubljana stores during the summer. My new word of the day was “Popusti” (discounts)! Many of the tags helped me sort out the sizes with numbers for both EU and US. And it was the perfect opportunity to practice my mastery of useful Slovene phrases like “Koliko stane?” (How much?) with friendly salespersons who spoke only basic English. On the day of the interview, the skies opened up and drenched Ljubljana with heavy rain. I wrapped my new outfit in a plastic bag and headed across the pedestrian zone to the TV station. By the time I arrived 20 minutes later, I looked like a drowned cat. Fortunately, the hair and makeup room transformed me, with HD makeup and even concealer to cover my hair’s multicolored roots. 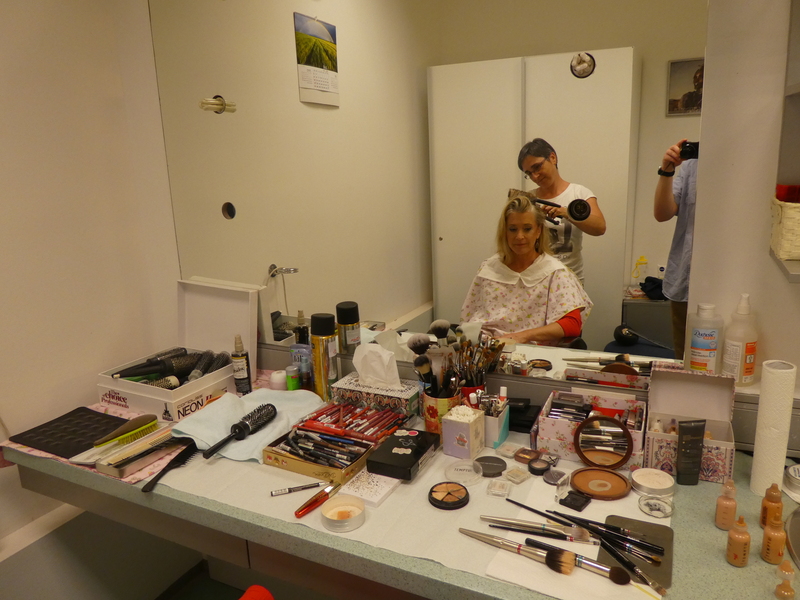 A thoroughly professional makeup artist transformed me from the drowned cat look. And then there was the host, Igor Evgen Bergant, who goes by the initials IEB. Make that IED, because his laser beam-focused questions invite comparison to longtime ABC Nightline host Ted Koppel. I had been booked on the program while Bergant was out of town, and flights delayed by the stormy weather meant that we’d only have a few minutes for a pre-interview. 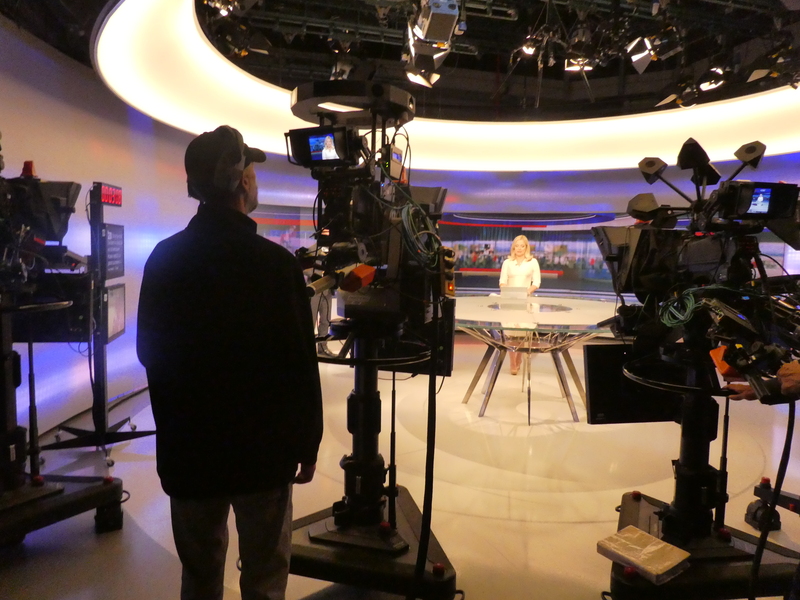 He graciously showed me around the studio and newsroom, commenting on how Slovenia’s public broadcaster is coping with the disruptive shift to news coverage on digital and mobile platforms. We sat down in a small conference room and discussed news coverage of both Donald and Melania Trump. Bergant is well known to Slovene audiences as a sports broadcaster, announcing world sporting events since the 1984 Olympics in Los Angeles. But it’s his uncanny ability to fluently interview people in at least six languages that makes him invaluable as one of the rotating hosts of Odmevi. Much of the reaction to the interview seemed to be from viewers who thought Bergant was surprised by my answers. The truth is that he knew exactly what I was going to say. The other theme that resonated with the social media audience was the overwhelming negativity of Trump coverage. The US system of government is predicated on an adversarial relationship between a free press and the three branches of government. Critical reporting on all sides of the story is normal and necessary. As a journalist who came of age during Watergate, I think the biggest shift may be the fact that “objectivity” has been abandoned in favor of reporters choosing sides. I cited a Harvard study showing that coverage of Trump’s first 100 days has been 80% negative overall, and even as high as 93% negative on outlets such as NBC and CNN. This may be a reflection of the times we live in; members of Congress — and the people they represent — seem no longer able to come together to reach compromises that move the country forward, instead shouting from opposite sides of the partisan divide. This didn’t start with Trump, but it has intensified as Trump has publicly punched back. 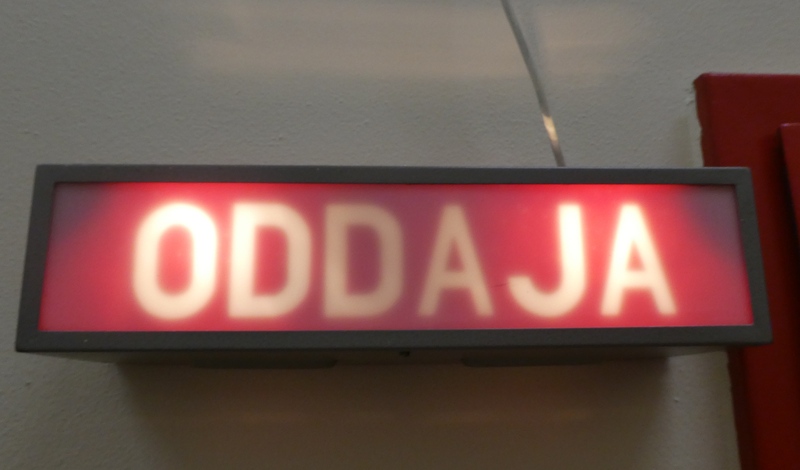 Recorded interview was subtitled in Slovene. The conversation shifted to the First Lady. Born during the Yugoslavian regime in the small town of Sevnica, her presence on the world stage is a source of fascination in Slovenia. The big question: why don’t we ever hear her speaking Slovenian? I shared my personal opinion that she will need to speak up a lot more in order to embrace the traditional role of the First Lady in the United States. As I write this, she is traveling with the president to the flood-ravaged state of Texas. What is the media commenting on? Her shoes. I can see why she might prefer to keep a low profile, but as someone who works with people who appear in front of a camera to deliver a message, I would welcome the opportunity to coach her! 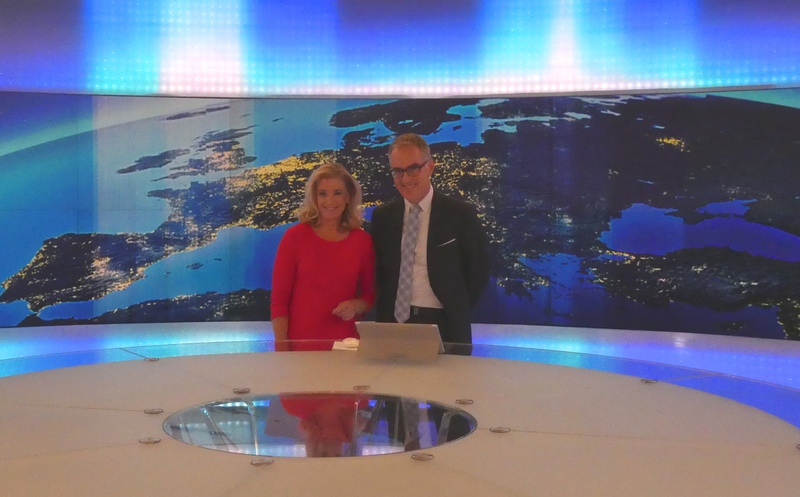 With Igor Even Bergant, one of the rotating hosts of Odmevi on TV Slovenia. Bergant kindly allowed me to express the pride that I feel in becoming a citizen of Slovenia and making an attempt to learn the language. And he invited me to return when I can answer his questions in Slovene. Fortunately, I didn’t have to wait that long to continue our conversation. We met the next day for lunch. Post-interview, discussing journalism with Helena Milinkovic. 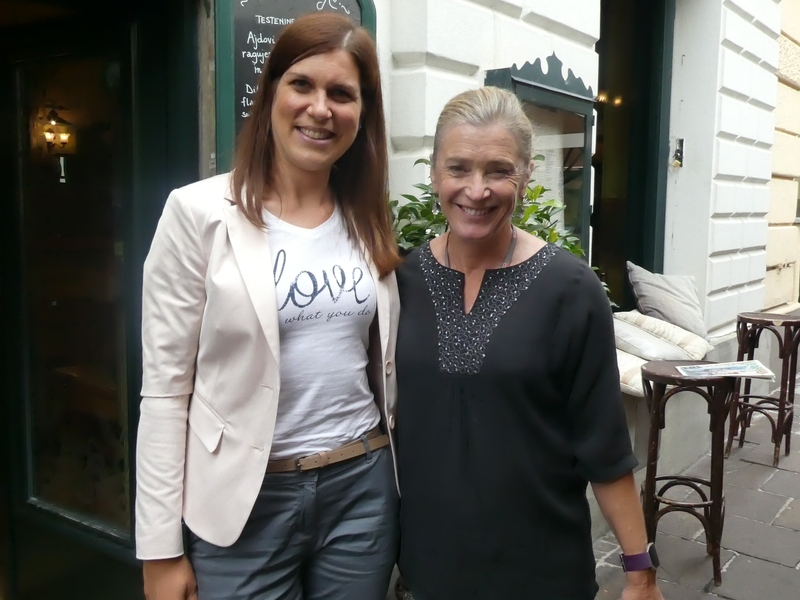 I also had the pleasure of meeting journalist Urška Makovec, who followed up on the TV interview. We talked for 20 minutes and she translated the entire thing for the news website siol.net. Impressive. Online journalist Urška Makovec translated our entire interview on free speech and role of the press in democracy. Again, from the reaction to this extended article I can see there are quite a few Slovenians who also would like to be part of the conversation, specifically about how the First Amendment works in the United States. One commenter expressed frustration that news reaching Slovenians is filtered through either state-run or foreign-owned media outlets. Another even suggested (jokingly, I hope) that as a citizen I could run for president in Slovenia on a truth-in-journalism platform. 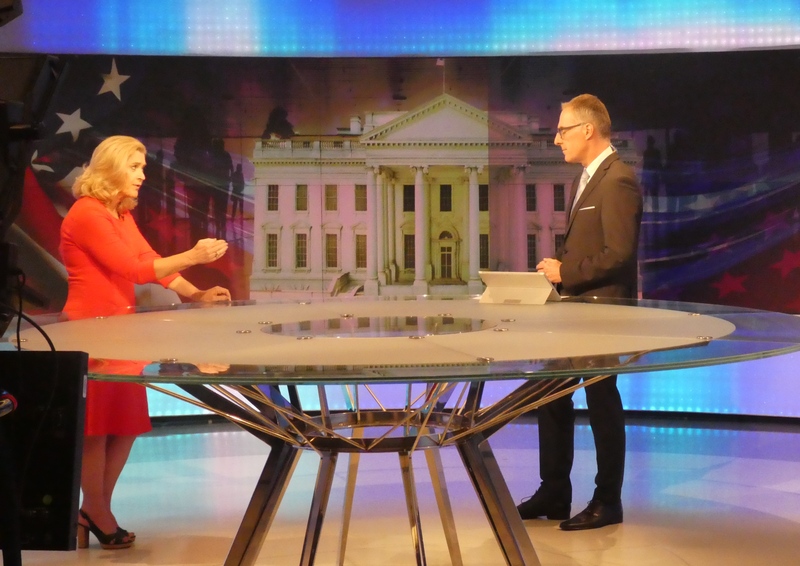 Yes, Donald Trump is a hot topic in both the US and Slovenia. But so are the nagging questions about whether the news media has let down its audience by taking partisan potshots at a time when our need for insightful reporting has never been greater. The evening news. I admired this news anchor’s clear, no-nonsense delivery.